Discussion in 'General Chatter' started by Helen, Oct 31, 2006. Your flowers just got delivered and they are absolutely beautiful. Thank you so much. Happy tears are such a good feeling. Lots of us have followed your amazing journey for months I think the least we wanted to do was send flowers to you to show how over joyed we were for your exciting news. awww congratulations hunny, I had no idea you went through IVF, so happy for you! so when do you find out how many are in there? Here's a pic. TBH at first I thought they were from my Mum cos they came with a vase and she knows how terrible I am with vases. LOL at the Secret Santa thing. and I was such a grouch about it too! Sorry guys. For the record, I am in. Lauz, hopefully find out at my first scan on 17th Nov how many mini travellers there are. I should be 6.5-7 weeks at that point. One of the best things about IVF is the extra scan early on to put your mind at rest. Thanks again everyone. You are all very sneaky! What is that pink thing!! Helen please tell me the picture does no justice? 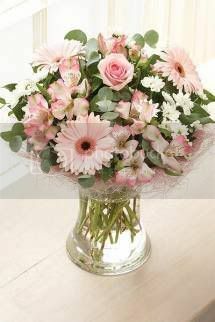 I had the same vase/flowers in blue when i had Coby, they are stunning, the picture really doesnt do them justice. 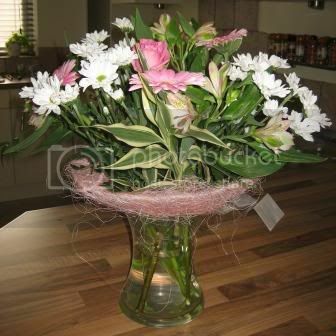 The pink weave thing is to hide the edge of the vase, strange but pretty! Sorry Wobbles. David Bailey, I ain't! Honestly, they are lovely they really are... even the pink thing!! 2 .. 3 .. 4 ..